Robin van Persie's hat-trick inspired Arsenal to an incredible victory against Chelsea as their recovery gathered momentum in a Stamford Bridge thriller. And it was a miserable afternoon for Chelsea and England captain John Terry at the end of a week in which has he faced allegations of racial abuse against QPR's Anton Ferdinand - claims he vehemently denies. Terry scored to give Chelsea the lead just before half-time but then slipped crucially late on to gift Van Persie a goal and a lead Arsenal never relinquished. Frank Lampard had headed Chelsea in front after 14 minutes but, in a game strewn with defensive errors, Van Persie put Arsenal back in contention from Gervinho's pass. Terry's goal looked to have put Chelsea in control on the stroke of half-time but Arsenal's response presented a compelling case for Arsene Wenger's insistence that reports of his side's demise have been greatly exaggerated. Andre Santos equalised and the outstanding Theo Walcott put Arsenal ahead for the first time before Juan Mata's spectacular strike set up the finale to an enthralling encounter. Terry lost his footing to allow Van Persie to race clear for Arsenal's fourth after 85 minutes before the Netherlands striker completed a second treble against Chelsea by hammering his third past Petr Cech deep into stoppage time. Wenger's wild celebrations with his players and backroom staff told the Chelsea 3-5 Arsenal story - and made it eight wins in Arsenal's last nine games. Arsenal have been piecing their season back together after a poor start and the manner of this win will provide added reserves of confidence and self-belief. 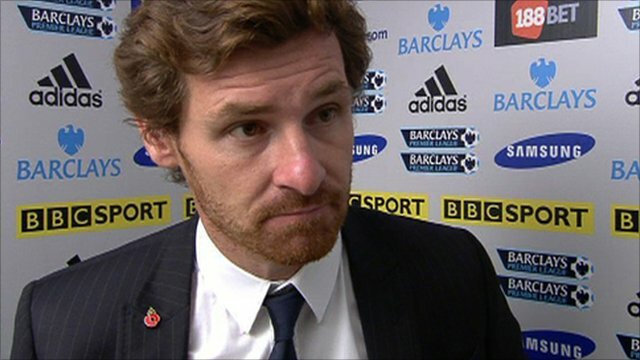 For Chelsea coach Andre Villas-Boas, this was his most sobering moment in the Premier League and he looked stunned on the sidelines at the regularity with which the home defence was exposed. Fernando Torres was recalled in place of the suspended Didier Drogba and he was only denied a goal in the opening seconds by Laurent Koscielny's intervention - a moment that set the tone for a game filled with attacking quality and littered with errors. Walcott, in front of watching England coach Fabio Capello, was Arsenal's catalyst and twice delivered crosses that should have produced goals in the opening stages. He presented Gervinho with what looked a certain goal only for the striker to fire wide with the goal at his mercy, then found Van Persie unmarked at the far post, but the striker could not keep his effort down. Arsenal paid the price for that wastefulness when Chelsea took the lead. Mata was afforded too much space by Santos and when the ponderous Per Mertesacker missed his cross Lampard timed his arrival perfectly to head past Wojciech Szczesny. This was one of the best matches you will ever see. We've had Manchester United 8-2 Arsenal and Manchester United 1-6 Manchester City - this was better. It could have been 10-10. Earlier in season, Arsenal were staring into an abyss, but they've recently put together a great run. Lampard was then the creator with a wonderful ball to release Daniel Sturridge, but he scuffed a half-hit shot across the face of goal. Terry, almost inevitably, made his mark on the game when he put Chelsea back in front seconds before the interval, sending a scrambled finish past Szczesny from Lampard's corner. Van Persie's shot was blocked by the legs of Cech and the impressive Ramsey was inches over before Santos suggested his greatest qualities may lie in attack when he beat the Chelsea keeper with some composure to put Arsenal level once more. Walcott's display deserved a goal and it duly arrived after 55 minutes. As he had done throughout, the winger ran straight at Chelsea's defence, riding two challenges and even falling before firing an emphatic shot past Cech. Szczesny was then fortunate to escape with a yellow card for hauling down Ashley Cole outside the area - but the drama simply continued until the final whistle. Mata put Chelsea back on terms with a swerving 25-yard shot, although a furious Wenger was convinced substitute Romelu Lukaku had fouled Santos in the build-up. As Chelsea's fans sensed a late winner, they were stunned when Terry's slip proved crucial. He fell to the ground as he tried to retrieve a wayward pass from Florent Malouda, leaving Van Persie to show his nerve by rounding Cech to score. And Van Persie fittingly had the final word with seconds to go by escaping Chelsea's defence once more to thump high past Cech in front of Arsenal's joyous supporters. 90:00+4:58 The game is over, as the referee blows his whistle. 90:00+2:40 Foul by Fernando Torres on Clarindo Andre Santos, free kick awarded. Wojciech Szczesny takes the free kick. 90:00+1:40 Booking The referee books Raul Meireles for dissent. 90:00+1:07 Assist on the goal came from Mikel Arteta. 90:00+1:07 GOAL - Robin van Persie:Chelsea 3 - 5 Arsenal Robin van Persie grabs a goal from inside the penalty area to the top left corner of the goal. Chelsea 3-5 Arsenal. 90:00+0:44 Juan Mata takes a shot. Clarindo Andre Santos gets a block in. 90:00+0:19 Raul Meireles delivers the ball from the free kick right-footed from left channel, Wojciech Szczesny makes a save. 90:00+0:19 Booking Alex Song is cautioned by the ref for unsporting behaviour. 89:59 Foul by Alex Song on Florent Malouda, free kick awarded. 88:35 The assistant referee signals for offside against Fernando Torres. Wojciech Szczesny restarts play with the free kick. 88:20 Juan Mata takes a weak shot. Blocked by Laurent Koscielny. 87:11 Florent Malouda crosses the ball in from the free kick, blocked by Laurent Koscielny. 87:11 Substitution Thomas Vermaelen replaces Yao Gervinho. 87:11 Aaron Ramsey concedes a free kick for a foul on Raul Meireles. 84:19 GOAL - Robin van Persie:Chelsea 3 - 4 Arsenal Robin van Persie scores a goal from inside the area to the bottom left corner of the goal. Chelsea 3-4 Arsenal. 82:50 Free kick awarded for a foul by Tomas Rosicky on Branislav Ivanovic. Direct free kick taken by Jose Bosingwa. 81:16 Alex Song challenges Frank Lampard unfairly and gives away a free kick. Raul Meireles takes the direct free kick. 79:58 Raul Meireles provided the assist for the goal. 79:58 GOAL - Juan Mata:Chelsea 3 - 3 Arsenal Juan Mata grabs a goal from outside the area to the bottom left corner of the goal. Chelsea 3-3 Arsenal. 78:05 Direct free kick taken by Wojciech Szczesny. 78:05 Substitution Tomas Rosicky replaces Theo Walcott. 78:05 Booking Branislav Ivanovic is cautioned by the ref for unsporting behaviour. 77:57 Booking The referee shows Robin van Persie a yellow card. 77:27 The assistant referee signals for offside against Fernando Torres. 75:59 The ball is crossed by Alex Song, clearance by Branislav Ivanovic. 75:17 Substitution Raul Meireles on for Mikel. 74:44 Substitution Carl Jenkinson joins the action as a substitute, replacing Johan Djourou. 73:30 Robin van Persie takes a inswinging corner to the near post, Frank Lampard manages to make a clearance. 73:15 Aaron Ramsey takes a shot. Blocked by John Terry. 71:41 Substitution (Chelsea) makes a substitution, with Romelu Lukaku coming on for Ramires. 70:48 A cross is delivered by Theo Walcott, clearance by Branislav Ivanovic. 69:32 Free kick awarded for an unfair challenge on Aaron Ramsey by Florent Malouda. Aaron Ramsey takes the direct free kick. 67:35 Free kick awarded for an unfair challenge on Ramires by Alex Song. Free kick crossed right-footed by Frank Lampard, save by Wojciech Szczesny. 66:02 Mikel Arteta concedes a free kick for a foul on Florent Malouda. Ramires takes the direct free kick. 63:14 Alex Song concedes a free kick for a foul on Juan Mata. Frank Lampard takes the direct free kick. 61:00 John Terry restarts play with the free kick. 61:00 Substitution Florent Malouda replaces Daniel Sturridge. 61:00 Alex Song concedes a free kick for a foul on Frank Lampard. 60:38 Aaron Ramsey takes a shot. Save by Petr Cech. 59:42 Free kick awarded for an unfair challenge on Ashley Cole by Robin van Persie. Free kick crossed by Frank Lampard, save by Wojciech Szczesny. 59:06 Jose Bosingwa sends in a cross. 57:27 Ashley Cole produces a left-footed shot from the edge of the area and misses to the left of the goal. 54:58 GOAL - Theo Walcott:Chelsea 2 - 3 Arsenal Theo Walcott finds the net with a goal from deep inside the penalty box to the bottom right corner of the goal. Chelsea 2-3 Arsenal. 54:41 Ashley Cole challenges Theo Walcott unfairly and gives away a free kick. Direct free kick taken by Robin van Persie. 52:52 The ball is sent over by Frank Lampard, Clarindo Andre Santos manages to make a clearance. 50:40 Corner taken short by Ramires. 49:26 Strike comes in from Frank Lampard from the free kick, brilliant save by Wojciech Szczesny. 49:26 Booking Wojciech Szczesny is booked. 49:13 Foul by Wojciech Szczesny on Ashley Cole, free kick awarded. 48:03 Assist on the goal came from Alex Song. 48:03 GOAL - Clarindo Andre Santos:Chelsea 2 - 2 Arsenal A goal is scored by Clarindo Andre Santos from deep inside the penalty box low into the middle of the goal. Chelsea 2-2 Arsenal. 47:13 Fernando Torres has an effort at goal. Save by Wojciech Szczesny. 47:06 A cross is delivered by Fernando Torres. 46:39 Free kick awarded for an unfair challenge on Yao Gervinho by Ramires. Clarindo Andre Santos restarts play with the free kick. 45:52 Effort from deep inside the area by Aaron Ramsey clears the bar. 45:27 Robin van Persie takes a shot. Petr Cech makes a save. 45:00+1:31 The whistle is blown to end the first half. 45:00+1:10 Free kick awarded for an unfair challenge on Ashley Cole by Yao Gervinho. John Terry takes the direct free kick. 44:42 The assist for the goal came from Frank Lampard. 44:42 GOAL - John Terry:Chelsea 2 - 1 Arsenal John Terry fires in a goal from deep inside the penalty box to the bottom left corner of the goal. Chelsea 2-1 Arsenal. 42:54 Centre by Theo Walcott, Branislav Ivanovic makes a clearance. 41:20 Yao Gervinho challenges Ramires unfairly and gives away a free kick. Free kick taken by Branislav Ivanovic. 40:37 Free kick awarded for an unfair challenge on Per Mertesacker by Fernando Torres. Direct free kick taken by Wojciech Szczesny. 39:08 Free kick awarded for an unfair challenge on Theo Walcott by Mikel. Robin van Persie has an effort direct from the free kick. 38:20 The offside flag is raised against Daniel Sturridge. Free kick taken by Wojciech Szczesny. 37:00 Free kick awarded for a foul by Aaron Ramsey on Frank Lampard. John Terry takes the free kick. 35:47 Assist on the goal came from Yao Gervinho. 35:47 GOAL - Robin van Persie:Chelsea 1 - 1 Arsenal Robin van Persie finds the back of the net with a goal from inside the box to the bottom left corner of the goal. 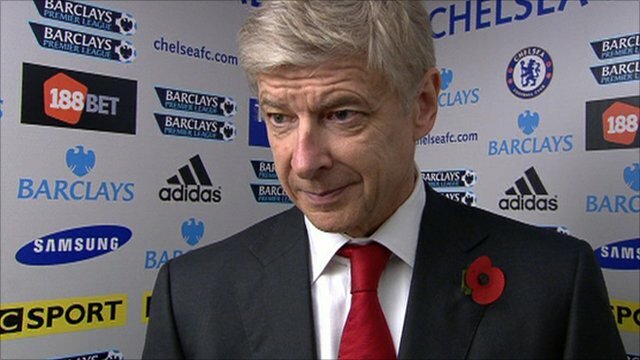 Chelsea 1-1 Arsenal. 35:06 Robin van Persie produces a cross, clearance made by Ashley Cole. 34:41 The ball is sent over by Jose Bosingwa, save by Wojciech Szczesny. 31:56 The ball is crossed by Theo Walcott, save by Petr Cech. 29:50 The assistant referee flags for offside against Fernando Torres. Per Mertesacker restarts play with the free kick. 29:23 Robin van Persie concedes a free kick for a foul on Ashley Cole. Direct free kick taken by Petr Cech. 28:37 Effort from inside the area by Daniel Sturridge misses to the left of the goal. 28:16 The assistant referee signals for offside against Yao Gervinho. John Terry takes the indirect free kick. 27:25 Centre by Robin van Persie, clearance made by John Terry. Correction - 25:39 Shot by Ashley Cole. Wojciech Szczesny makes a comfortable save. 25:39 Ashley Cole takes the chance to get an effort at goal. Save made by Wojciech Szczesny. 25:27 The ball is crossed by Fernando Torres, clearance made by Laurent Koscielny. 24:31 Yao Gervinho is ruled offside. Free kick taken by Branislav Ivanovic. 22:23 The ball is swung over by Juan Mata, blocked by Per Mertesacker. 18:44 Header by Per Mertesacker from deep inside the penalty area misses to the left of the target. 18:08 Corner taken by Mikel Arteta played to the near post, John Terry makes a clearance. 17:16 Frank Lampard gives away a free kick for an unfair challenge on Mikel Arteta. Alex Song takes the free kick. 17:11 A cross is delivered by Daniel Sturridge, clearance by Clarindo Andre Santos. 15:42 A cross is delivered by Robin van Persie. 15:14 A cross is delivered by Daniel Sturridge, save made by Wojciech Szczesny. 13:35 The assist for the goal came from Juan Mata. 13:35 GOAL - Frank Lampard:Chelsea 1 - 0 Arsenal Frank Lampard finds the back of the net with a headed goal from deep inside the penalty area. Chelsea 1-0 Arsenal. 12:20 Theo Walcott delivers the ball, Strike from close range by Robin van Persie clears the bar. 11:20 The ball is delivered by Theo Walcott, Shot by Yao Gervinho from deep inside the penalty area misses wide to the left of the target. 10:22 Free kick awarded for a foul by Mikel Arteta on Ramires. Frank Lampard has a direct shot on goal from the free kick. Correction - 10:07 Robin van Persie is flagged offside by the assistant referee. Branislav Ivanovic takes the free kick. 8:45 The ball is swung over by Jose Bosingwa. 7:33 Aaron Ramsey challenges Ramires unfairly and gives away a free kick. Branislav Ivanovic takes the direct free kick. 6:08 Unfair challenge on Daniel Sturridge by Mikel Arteta results in a free kick. Frank Lampard restarts play with the free kick. 4:26 The ball is crossed by Daniel Sturridge, save by Wojciech Szczesny. 3:33 Ashley Cole crosses the ball. 3:09 Free kick awarded for an unfair challenge on Daniel Sturridge by Clarindo Andre Santos. Daniel Sturridge restarts play with the free kick. 2:43 Aaron Ramsey delivers the ball. 1:47 Frank Lampard decides to take the corner short. 1:22 Ashley Cole produces a cross, Fernando Torres takes a shot. Laurent Koscielny gets a block in.